Before we begin discussing the blessing on popcorn, let us first introduce this topic with another matter. The Gemara in Masechet Berachot (36b) states that the blessing on crushed fragrant spices mixed with honey is “Boreh Peri Ha’adama.” The Gemara continues and explains that this refers to ginger candied with honey (similar to a jelly). The Tur (end of Chapter 203) writes in the name of the Rabbeinu Meir of Rottenberg: “It seems to me that the proper blessing on ground spices mixed with sugar is Ha’adama just like the (Gemara’s) candied ginger.” Maran Ha’Bet Yosef points out that it seems self-explanatory that the Ha’adama blessing is recited on such ground spices mixed with sugar, for the Gemara teaches us this explicitly regarding the candied ginger. If so, what is the Maharam of Rottenberg coming to add? Maran Ha’Bet Yosef explains that from the Gemara itself we may have inferred that only when the spices are noticeable among the mixture is the “Boreh Peri Ha’adama” blessing recited. However, in the Maharam’s case, there may have been room to claim that since the spices are completely ground, they are considered secondary to the sugar and the “Shehakol Nihya Bidvaro” blessing should be recited on the entire mixture. Thus, the Maharam of Rottenberg teaches us a novel law that it does not matter that the spices are completely ground and in any event we recite the blessing appropriate to them and we do not say that the spices are considered secondary to the sugar. Maran rules likewise in his Shulchan Aruch: “Regarding ground spices mixed with sugar, the spices are considered primary and the blessing is recited based on the spices and not the sugar.” The Kaf Ha’Chaim explains that this only applies if the spices are not completely ground, for if they are and it is not at all noticeable that such spices are present in this mixture, the blessing reverts to “Shehakol Nihya Bidvaro.” He quotes the Sefer Shenei Luchot Ha’Berit as ruling likewise. Clearly, according to his opinion, if a food is in a state where it is unnoticeable what it originated from, the Shehakol blessing is recited. Nevertheless, after discussing with this matter lengthily, Maran Rabbeinu Ovadia Yosef zt”l writes that the Kaf Ha’Chaim’s opinion on this matter is not necessarily correct. Indeed, he quotes the Responsa Benei Yehuda who rebuffs the opinion of the Shenei Luchot Ha’Berit and writes that we maintain that even if the form of the fruit is not evident in the food, if it is the primary ingredient of the dish, the blessing appropriate to it is recited. Thus, on ground spices mixed with sugar, one recites either “Boreh Peri Ha’etz” or “Boreh Peri Ha’adama” depending on the appropriate blessing of the specific spice. 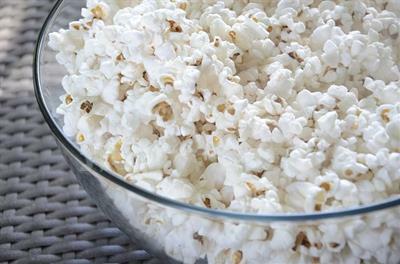 Regarding popcorn which is made from corn, although according to the Kaf Ha’Chaim one should recite the Shehakol blessing on this food since it does not resemble corn at all, nevertheless, since we have written that, halachically speaking, this does not make a difference, the proper blessing on popcorn is therefore “Boreh Peri Ha’adama” as this is the appropriate blessing on corn.